United Nations called on all parties to the conflict in eastern Ukraine to prioritize the protection of civilians and take urgent steps to de-escalate the increasingly tense situation at the contact line, warning that civilian casualty figures have risen dramatically in the past two months. The UN Human Rights Office documented 69 civilian casualties in eastern Ukraine in June 2016, including 12 dead and 57 injured. This was nearly double the figure for May 2016 and the highest figure since August 2015, UN High Commissioner for Human Rights Zeid Ra’ad Al Hussein said in a report on 3 August. In July, the figure rose further to 73 civilian casualties, including eight dead and 65 injured. The monthly average for June and July this year, at 71, was more than double the monthly average of 34 in the nine months between September 2015 and May 2016. “The escalation of hostilities and the accompanying civilian casualties in eastern Ukraine over the last two months are very worrying. 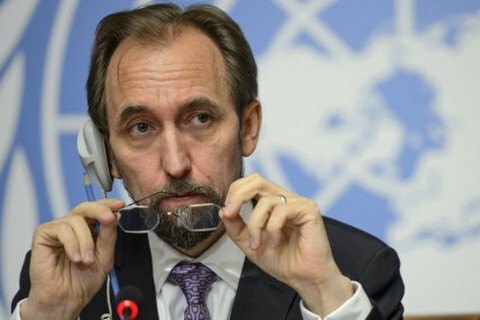 Civilians are once again having to flee to improvised bomb shelters in their basements, sometimes overnight, with increasing frequency – the price of the ceasefire violations is too high for the women, men and children in eastern Ukraine,” High Commissioner Zeid said. More than half of all the casualties recorded in the past two months were caused by shelling. Between 1 June and 31 July 2016, 72 civilians were injured and six killed by shelling, including allegedly through the use of weapons expressly prohibited by the Minsk Agreements. Mines, explosive remnants of war, booby traps and improvised explosive devices were responsible for most of the remaining casualties. The High Commissioner recalled that Ukraine has committed to ratify the Rome Statute of the International Criminal Court, but has yet to do so. “The ratification of the Statute, with its focus on individual criminal responsibility, will serve as incentive for all parties to the conflict to respect the law and ensure the protection of civilians,” he said.